As an admirer of the band They Might Be Giants, whose fans shorten its name to TMBG, I was amazed to see this vanity plate. 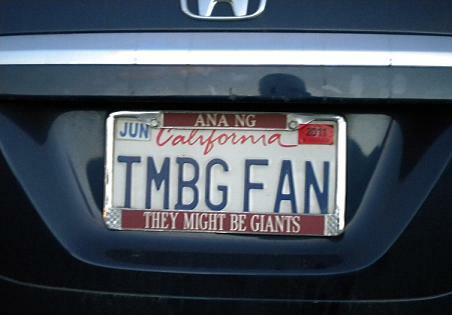 Quite a coup to get the perfect plate to express the sentiment that its owner likes They Might Be Giants. The frame, which notes the title of one of the band’s best-known songs, is icing on the cake. Seen recently near a sushi bar in Rancho Cucamonga.